This all-purpose lightweight magnifier helps reduce eyestrain while working on projects that demand up-close precision. The magnifier has a rotatable 3½" five-diopter lens for 2.25X magnification and a 12-diopter inset lens for 4X magnification. The lamp's low-heat LED light delivers high contrast and accurate color matching. Choose from three brightness levels. Max brightness is 4,000 lux. 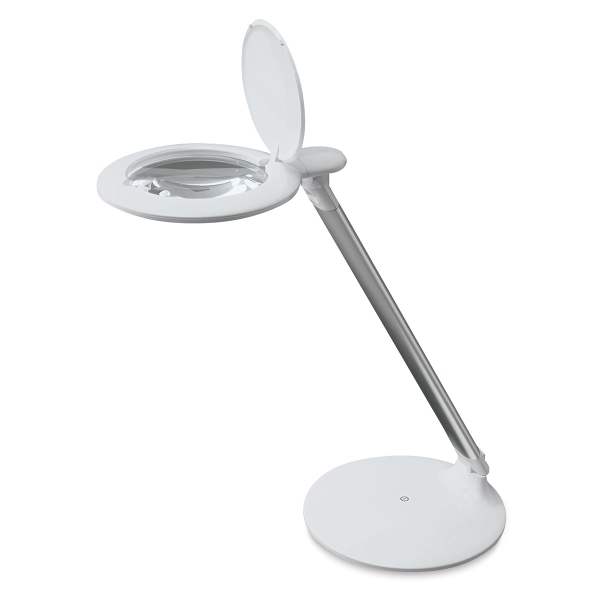 Take the compact, foldable Daylight Halo Table Magnifier Lamp anywhere. When you arrive, simply unfold the lighted magnifier, plug it in, and get to work.